From the late 1940's to 1997, the upscale toaster market was dominated by this classic from Sunbeam. Its sophisticated lines, art deco styling, and consistent toasting quality made it a pleasure both to the eyes and the palate. Going out of production at about the time of the rise of the Web, the T-20 and its progeny (the T-35, VT-40, 20-30, and AT-W, among others) have been popular items on eBay. Aging boomers recalling mom's or gramma's kitchen have dumped their $9.99 plastic WalMart disposable wedding-gift toasters and have come back home to a warm, shiny friend. Why the Radiant Control Toaster? The Sunbeam Radiant Control toaster is a classic for several reasons. It's beauty is apparent. But its real appeal is in its performance. Sunbeam called it Automatic Beyond Belief. There are no levers to press down. Just put the bread in the slot. The weight of the bread activates the heating elements, causing the center wire to lengthen microscopically and the bread to be carried into the toaster under its own weight. Inside, the Radiant Control thermostat monitors the heat radiated (not conducted) from the outer surface of the bread, which is directly proportional to its color change. There are no timers. The toast is raised only when it is properly toasted; no sooner and no later. When the thermostat opens, the elements cool, and the center element wire contracts. This movement is very small — on the order of thousandths of an inch — but a mechanical linkage multiplies this movement approximately 175 times. This is sufficient to operate the carriage and raise the toasted bread from the toaster. Once a person has experienced a Radiant Control toaster, the common response is, "This is how all toasters should work." One couldn't express the understated elegance of this toaster more succinctly. This site is dedicated to telling the story of the Sunbeam Radiant Control toaster line. It is maintained by a dedicated collector. Not of antiques, but of toasters. And not of any toaster, but Sunbeam toasters. Not all Sunbeam toasters, but Sunbeam Radiant Control toasters. Over time this site will grow to fully document this collection, thus making this private treasure trove available for the world to enjoy. This site is under continuous construction as the collection is photographed and documented. For now, enjoy the few pictures that are here and get a taste of what's to come. Text and photographs on this site Copyright © 2005, 2006 by Craig Rairdin. All Rights Reserved. If you wish to use photos or text from this site, contact us at info@automaticbeyondbelief.org. We are quick to grant permission to those who request it, and quick to prosecute those who do not. About the images. The banner across the top of this site is scanned from a 1950's advertising display. The slogan was painted on a clear plastic panel that is lit from behind. When placed on a flat-bed scanner, the letters cast their own drop shadow; there's no PhotoShop effects here. 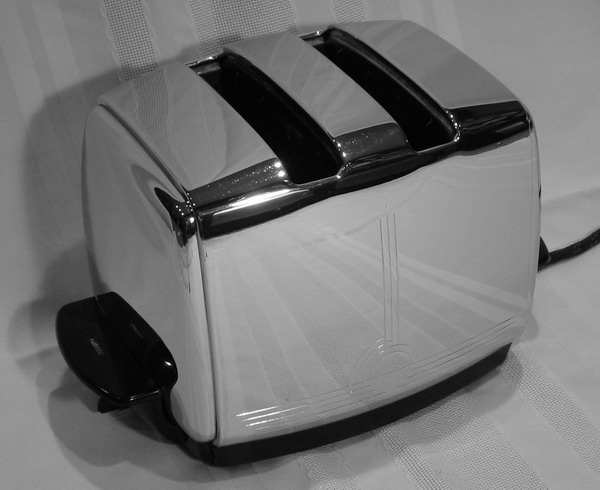 The photograph at the top of the page is of a T-20 A, one of the early toasters in the collection. It is in mint, unused condition. The button above is taken from the same advertising display that the banner is from. The display can be seen in the Gallery.